Pediatric Cardiology - is the science that deals with the study of the structure, functioning and development of the cardiovascular system, as well as detection methods of diagnosis and treatment of such diseases in children. 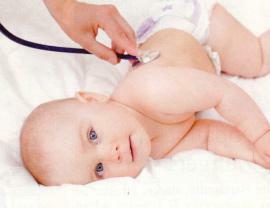 Pediatric Cardiologist - a doctor who deals with problems of the cardiovascular system in children and adolescents. It is very important for the child to pass timely preventive examination at the children's cardiologist, because the sooner will diagnosed, the more chances for a successful recovery. In children cardiovascular diseases may be either congenital or acquired. Congenital diseases occur in the fetus in the first half of pregnancy. Reasons for their development are many: it is a genetic predisposition and the environment, and the impact of intrauterine infections, and frequent stress and emotional overload, which is so often exposed to all pregnant women. Acquired cardiovascular disorders occur in children, usually due to infections that are not fully cured. Even an ordinary angina can lead to the development of any disease of the heart, so to any disease in a child should be treated with special attention and to do everything to cure it through. If the earlier on the consultation to children cardiologist led only with congenital abnormalities, now there you can see the children, even with violation of the heart rate - the disease is very serious and dangerous. During its the presence, death of the baby can come at any moment. In what cases the child must show a Cardiologist? When a child feels pain in the joints. Swelling of the joints or swelling also should alert you. Cardiologist will examine your child, hold a conversation with him, he will appoint the necessary diagnostic tests, after which he will be able to accurately diagnose the disease. Treatment of cardiovascular disease is almost always based on the use of special drugs, adherence of proper nutrition and maintaining a healthy lifestyle. In case if the child will need surgery, it will be produced.